BEIJING, Nov. 3, Chinese Premier Li Keqiang Saturday pledged to strengthen its all-weather strategic cooperative partnership with Pakistan and build a closer community with a shared future between the two countries. Li made the remarks in Beijing when holding talks with Pakistani Prime Minister Imran Khan, who is paying an official visit to China and will attend the first China International Import Expo in Shanghai. China and Pakistan are good neighbors, good friends and good partners, Li said, adding that the traditional friendship between the two countries is deep-rooted. He stressed that China and Pakistan, as all-weather strategic cooperative partners, have a high level of political mutual trust and close cooperation in various fields, firmly supporting each other on matters that concern their core interests. "China always regards Pakistan as a diplomatic priority," Li said. During Khan's visit to China, the two sides will issue a joint statement to send an important signal to the world that China and Pakistan are committed to promoting a better and faster development of bilateral ties, according to Li. Ont the China-Pakistan Economic Corridor (CPEC), Li said that CPEC projects have been meticulously examined, conform to commercial principles and are economically feasible.
" China is willing to continue working with Pakistan to accelerate the construction of the CPEC in accordance with the principle of openness and transparency, in order to benefit both peoples," he said. China appreciates Pakistan's commitment to safeguarding CPEC construction as well as the personal safety of Chinese institutions, and hopes that Pakistan will continue to make greater efforts, Li said. Li also promised to expand the imports of and market access for quality products from Pakistan, and strengthen bilateral cooperation in fields including finance, agriculture and fisheries. "We hope to see a stable and developing Pakistan. We are willing to provide assistance to Pakistan within our capability and work together to achieve regional peace, stability and prosperity," Li said. For his part, Khan said with the continuous deepening of the all-weather strategic cooperative partnership, the relations between the two countries at all levels are becoming stronger. He said the CPEC has become a reality and is being fully implemented. Pakistan views the CPEC as a great opportunity for development, benefiting the Pakistani people and promoting Pakistan's economic and social advancements. Pakistan will continue to promote CPEC construction and protect the safety of CPEC projects and Chinese staff, said Khan. 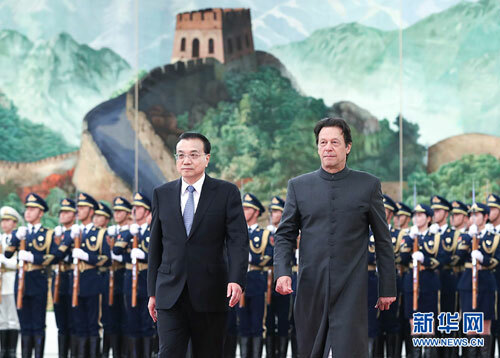 Khan thanked China for its strong support when Pakistan was in a difficult time, adding that Pakistan will always be a trustworthy friend of China. Hailing China's remarkable achievements during the past 40 years, Imran Khan said Pakistan also strives to push the domestic reforms process. "We are willing to learn from China's development experience, deepen pragmatic cooperation in various fields, and strengthen high-level visits and exchanges at all levels, so as to push the bilateral relations to a higher level," Khan said. After the talks, the two leaders witnessed the signing of more than 10 documents on cooperation in areas including science research, justice, poverty reduction, health and customs. Prior to the talks, Li held a red carpet ceremony to welcome Khan.